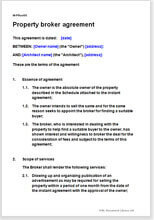 Comprehensive terms and conditions for any property broker - can be posted on a website or used as an agreement style to be negotiated between the parties. With minor alterations, the document can be used for transactions involving appointment of a broker for purchase of a property. This is a very small price for the peace of mind that comes to you with it. A broker arranging terms with the owner of a property. A schedule to give details of the property, site plan and/or drawings, if any.